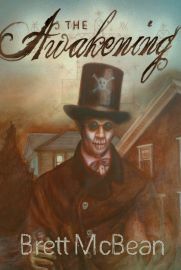 Announcing my new novel, The Awakening, coming soon from Tasmaniac Publications. For as long as he can remember, fourteen-year-old Toby Fairchild has been afraid of the strange old man living across the street. Along with the rest of the kids in the small Midwestern town of Belford, he sees the reclusive Mr. Joseph as the local bogeyman. Mr. Joseph’s life is an unhappy one. The memories of his past fill him with deep sorrow, and the kids of Belford have long been afraid of him, what with his unusual features and awkward gait. However, when Toby accidentally discovers the remarkable truth about Mr. Joseph, an unlikely friendship develops. Over the course of the summer, Toby will come to know about pain and death; loss and the meaning of freedom, as Mr. Joseph recounts the incredible story of his past back in Haiti. A story laced with voodoo spirits, slave plantations, evil sorcerers…and zombis. Toby will learn that monsters do exist – though not always where you expect to find them. This entry was posted on February 14, 2012 by brettmcbean. It was filed under Writing .